The head of the Republican National Committee, responding to demands from increasingly worried party leaders, spent nearly an hour Wednesday on the phone with Donald Trump, urging the presidential candidate to tone down his inflammatory comments about immigration that have infuriated a key election constituency. 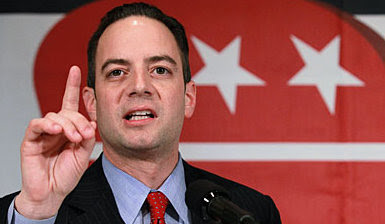 The call from Chairman Reince Priebus, described by donors and consultants briefed on the conversation and confirmed by the RNC, underscores the extent to which Trump has gone from an embarrassment to a cause for serious alarm among top Republicans in Washington and nationwide. But there is little they can do about the mogul and reality-television star, who draws sustenance from controversy and attention. And some fear that, with assistance from Democrats, Trump could become the face of the GOP. Yesterday Trump declared that he has "nothing to apologize for."